I have a small home-based kennel located just north of New Orleans in Slidell, LA. 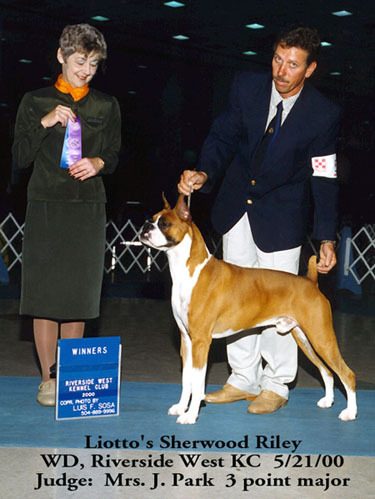 I started in 1989 with my first Boxer in Obedience. Many people at the time told me that Boxers were too stubborn to be trained and couldn’t do well in Obedience competition. I found a trainer, Larry Schillenkamp, who believed in us. Under his tutelage we became not only top competitors, but ambassadors for the Boxer breed. We showed people that not only were Boxers highly intelligent dogs but could do incredibly well in Obedience. I show in Agility, Rally and Conformation and have Boxers titled in all areas. I breed rarely but with the goals of correct conformation, working ability and health always in mind. All breeding dogs are fully health tested. With my Irish heritage, I tend to name my dogs Celtic names. Please visit their pages below. The graphics and music reflect each dog’s unique personality. Finished her MACH on 7/7/13 making her the very first Grand Champion/MACH Boxer!!! Winner of the 2005 ABC’s Performance Boxer Of The Year!!! Sherwood Shenanigans, NF “Shane” The newest member of the clan! Ivylane N Amour Here Comes The Reign “Annie” (Yet another non-Boxer! A Boston Terrier!) Wins a 4-point major on 5/30/13!! !